Does your Kids Ministry provide the nourishment needed for children and families to thrive in the gospel? Much like healthy food is necessary for growth and sustenance, so is the biblical nutrition we serve to our young ones. Just as He said to Peter, Jesus commands us to "feed my lambs." This means more than crackers and juice, attractional programming, and fun activities. All of these things can be part of Kids Ministry, but should not be the heart of it. 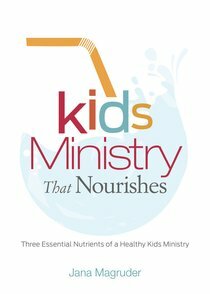 Kids Ministry that Nourishes will help guide preschool, children, and preteen leaders in churches of all shapes and sizes to champion a ministry philosophy based on three essential nutrients. Author Jana Magruder shows how these are the nutrients that help Kids Ministries provide the nourishment needed for children and families to thrive in the gospel. About "Kids Ministry That Nourishes"